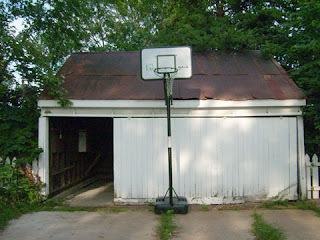 The tragic state of this garage is the reason for my recent lack of postings. Below is the photo of what the garage looked like at closing. This century-old, timber-sill, 20x22 foot garage is amazing; but looks can be deceiving. Here is the short; but deadly list of what needs to be done. Let me tell you that the list is going to take the better part of several weeks to accomplish. At this stage, we have removed the rotted siding planks and replaced them with new ones. It's a lovely patchwork of old and new right now; but once we paint everything you won't be able to tell. We have removed the sliding doors, so we had better access to the concrete floor; which is the real disaster, the whole one side was sunken in and had dropped approx. 8-10 inches from it's original position. The photo below shows the reason. It's a combination of bad workmanship and erosion. First, we have figured out that the dirt floor was never graded. They just poured concrete over the dirt that existed, there is no gravel or any sort of stabilatation. Some of the concrete measures 2" and some of it measures 6"...it's what I like to call a mishmash. 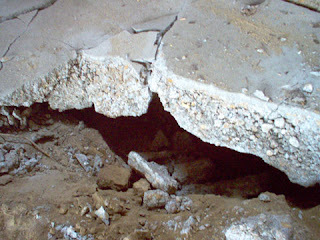 Secondly, erosion has eaten away the soft dirt underneath as seen in the photo above. Along the entire back wall is a 3 foot cavern and amazingly the concrete was "floating" over it. How the entire floor didn't cave in, I'll never know. 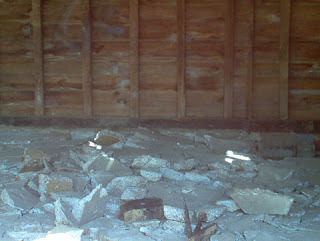 This is our in progress shot; but I'm happy to say that about 380 of the 440 sqft is now excavated and in the dumpster. The rest is lying in a pile waiting for our aching muscles to recoop. I'll show you more photos once we get further along, for now I need to take 2 Advil and lay down.